Are you struggling with that woodwind arrangement? Don’t worry, you’re not alone. It’s the most flexible section in the orchestra because each instrument has its own sound. But the trouble is… Well, each instrument has its own sound. How do you blend those different tone colours together, and also make the most each instrument? This blog will give you a few ideas on how to write woodwind arrangements with ease. 1. MIDI is notoriously terrible at woodwind sounds, so think twice before using it. 2. Don’t think of the instruments in terms of a hierarchy. Mix your palette and be imaginative with the colours. 3. Steer clear of dull chordal blocks and doubling. 4. Don’t forget about texture and mix things up a bit. 5. Don’t forget about dynamics either – woodwinds are flexible in terms of volume. 6. Keep your players happy and provide them with enough rest during the song (they aren’t string players). 7. Don’t be afraid to ask your players for guidance, they won’t mind. Flute – Cold in quality. Especially suitable, in the major key, to melodies of light and graceful character. In the minor key to slight touches of transient sorrow. Oboe – Artless and gay in the major, pathetic and sad in the minor. Clarinet – Pliable and expressive. Suitable, in the major, to melodies of a joyful or contemplative character or to outbursts of mirth. In the minor, to sad and reflective melodies or impassioned and dramatic passages. Bassoon – In the major, an atmosphere of senile mockery. A sad, ailing quality in the minor. Are you looking for info about saxophones? Check out our blog `How to write horn arrangements’. If you’re using a MIDI, be aware that they’re notoriously terrible at woodwind sounds, especially in the low and high registers. Please don’t rely on yours for an accurate soundscape. If you’re new to woodwind arranging, there’s only one way to get to know each instrument. Listen to the real thing. Try not to think of the instruments in terms of a hierarchy. It makes things boring. The flute is the highest instrument, but it doesn’t always need the melody. Mix your palette. Be imaginative with the colours. Try an oboe tune above a low register flute. The clarinet is capable of more extreme crescendi or diminuendi than any other wind instrument. It can purr like a cat or blast everything else out of the water. Bassoon and oboe, an octave apart, are a match made in heaven. Make the most of the bassoon’s tenor register. You can break hearts with it. The woodwind section as a whole is rich in overtones. If you’re clever with wide open chords, the harmonic gaps get filled in. However, steer clear of dull chordal blocks and doubling. Why waste resources? Endlessly held notes will bore your players and worse, waste an opportunity. These instruments like to move, even when the music is slow. When things speed up, they’ll perform impressive musical gymnastics – especially when it comes to fast runs and attention-grabbing flourishes. Woodwind players can switch instantly from smooth legato to percussive staccato, from gentle harmonic pulsing to soaring melody. Again, mix things up a bit. Go for an energetic zippy high flute against a lazy mid-register oboe, Move the clarinet about within the gorgeous depths of its chalumeau register below a plaintive high legato bassoon. If you’re after rhythmic punch, ask for fortissimo staccato attacks. They’ll rival the brass section for power. If you’re composing all day on a keyboard, it’s easy to stick to mezzo-everything. We’ve already mentioned the dynamic capabilities of the clarinet, but all these instruments are flexible in terms of volume. Use that to your advantage. Bear in mind that the flute and clarinet get louder as they go higher, the oboe does the reverse. Expecting an unobtrusive entry in its low register won’t go down well. The bassoon is, surprisingly, the quietest instrument in the entire orchestra. Its low register buzzes and reverberates, but isn’t as loud as you’d think. 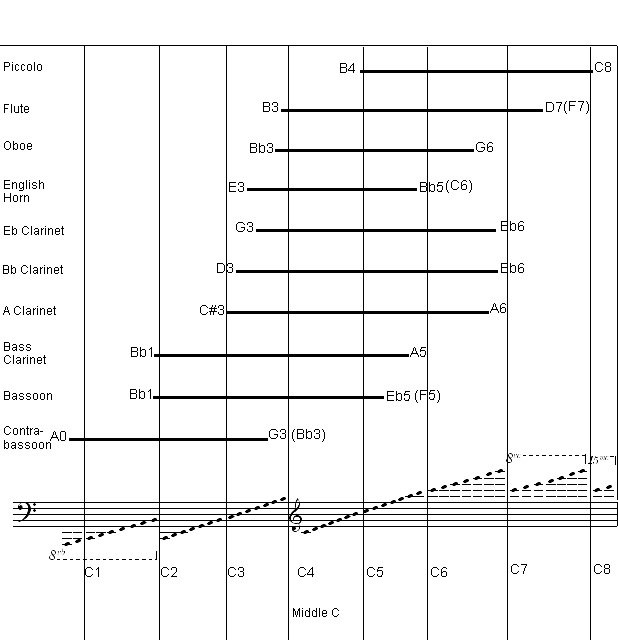 If you want a melody to cut through, write above middle C.
These guys aren’t string players. They need to breathe. Additionally, the muscular effort involved in maintaining an embouchure means that you’ll need to be considerate. The best woodwind musicians in the world won’t be capable of endlessly sustained notes without a couple of beats rest. Short bursts of fast repeated notes are fine, but it’s best to check with your players. Flautists find it easy to double or even triple-tongue so it shouldn’t be a problem – and most pro clarinet players can manage fast staccato. However, oboes and bassoons have to negotiate a double reed. Some can double tongue, others can’t. If in doubt, it’s best to ask. They really won’t mind giving you guidance. As we mentioned at the beginning, writing woodwind arrangements isn’t easy. Handing the job over to the professional may sound like an expensive option, but it doesn’t have to be. At a fraction of the normal cost, Supreme Tracks provides superb woodwind arrangers who’ll save you time and hassle without spending more than you can afford. And once you’re happy with the arrangement, we can also provide you with world-class woodwind section recording services.